IRISH President Michael D Higgins has launched a new Online English-Irish Dictionary. Ghost estates, cyberbullying, retweet, defriend and cloud computing are amongst the new words in the new English-Irish dictionary that President Michael D. Higgins launched (Thursday 24 January 2013) in the National Gallery in Dublin. This is the first national online English-Irish dictionary since the publication of de Bhaldraithe’s dictionary in 1959 and is available on www.focloir.ie, It is published by Foras na Gaeilge. In total, a team of 71 linguists and lexicographers have worked on this dictionary since 2000 and it will be completed in 2015. Writing the dictionary itself did not begin until 2008. New technological advances have made the process of collating this dictionary much more efficient – a far cry from Tomás de Bhaldraithe’s painstaking and arduous method of jotting hundreds of thousands of words down by hand. 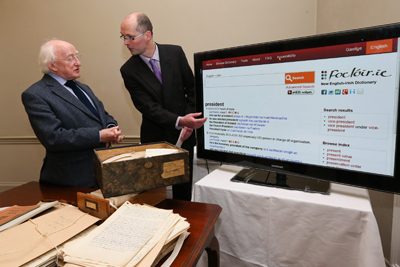 President Michael D.Higgins and Dr Pádraig O Mianáin, Senior Editor of the new online English-Irish dictionary – www.focloir.ie – published by Foras na Gaeilge, at the launch in the National Gallery in Dublin. This new online dictionary currently contains about a third of its final content. So far, it features 7,500 head words which have generated a total word count of 1.3m words, compared with de Bhaldraithe’s dictionary, which is still the standard text of its kind, and contains around 900,000 words in total. When the dictionary is completed, there will be approximately 40,000 headwords as well as example sentences, along with sound files and comprehensive grammar tools. “This is a huge undertaking by Foras na Gaeilge and the world-class team that worked on it for the past twelve years” he said. “This dictionary is not merely a direct translation of words, it’s a reflection of how we naturally express ourselves in both English and Irish. It will be an invaluable resource not only for Irish speakers but for learners of Irish throughout the world for many years to come” he said. “An important aspect of the 20 Year Strategy for the Irish Language 2010-2030 is being implemented through this ambitious project and the status of the Irish language as a contemporary living language is greatly enhanced as a result”, said the Minister for State. 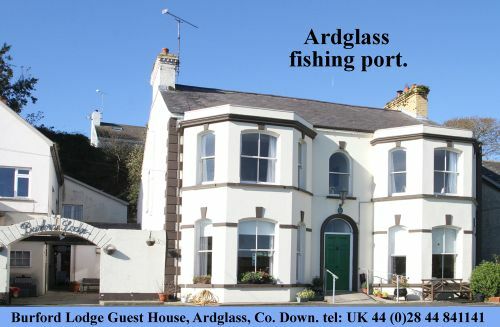 The online version will be expanded in the next two years, and the final version will be published both online and as a hard copy in 2015.
www.focloir.ie went live on Thursday 24 January 2013.